Members of the Gupta family, who’ve been implicated in looting billions of rand from state companies, are willing to give testimony before a judicial panel investigating the alleged graft but only from outside the country, said one of their lawyers. 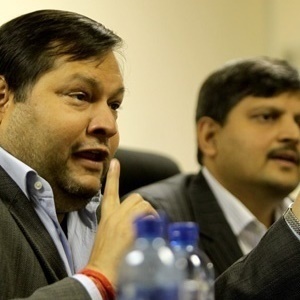 The three Gupta brothers have a “reasonable apprehension” that they could be arrested and prosecuted by authorities that are reckless, incompetent and wield unbridled power, Mike Hellens, Ajay Gupta’s lawyer, told the panel in Johannesburg on Thursday. The Guptas are friends with Jacob Zuma, who was forced by the ruling party to resign as president in February, and were in business with his son, Duduzane. Former Public Protector Thuli Madonsela alleged in a report that they may have used their political connections to influence cabinet appointments and the awarding of state contracts, and directed that the judicial panel be established to investigate the matter further. The Guptas would testify before the panel headed by Deputy Chief Justice Raymond Zondo in another country or via video conference, Hellens said. Should the panel not agree to their terms it could be deprived of vital information, he said.